The below artworks are the most important in Fashion Photography - that both overview the major ideas of the movement, and highlight the greatest achievements by each artist in Fashion Photography. Don't forget to visit the artist overview pages of the artists that interest you. Artwork description & Analysis: Considered the father of modern Fashion Photography, Steichen's portrait of silent movie star Gloria Swanson remains one of his most celebrated commercial works. Produced while he was house photographer at both Vanity Fair and Vogue, Steichen's image merges the worlds of fine art portraiture and Fashion Photography to spellbinding effect and provides an early example of how the worlds or art, entertainment, and fashion would interrelate. The image was published in the February 1928 issue of Vanity Fair to help publicize Swanson's latest film Sadie Thompson (a topical story of a free-spirited, jazz-age woman who, following a scandal, relocates to a tropical island where she seeks redemption). Steichen's great skill (or one of his great skills) was his ability to work with his models and to draw the very best out of them. It was a knack that all the great Fashion Photographers would need to master. Artwork description & Analysis: Man Ray's iconic photograph shows the French nightclub singer, actress and painter, Alice Prin; better known in the cultured Parisian circles in which she moved as Kiki de Montparnasse. With her eyes closed, her head reclines on a table beside an ebony African mask which she holds upright in her left hand. 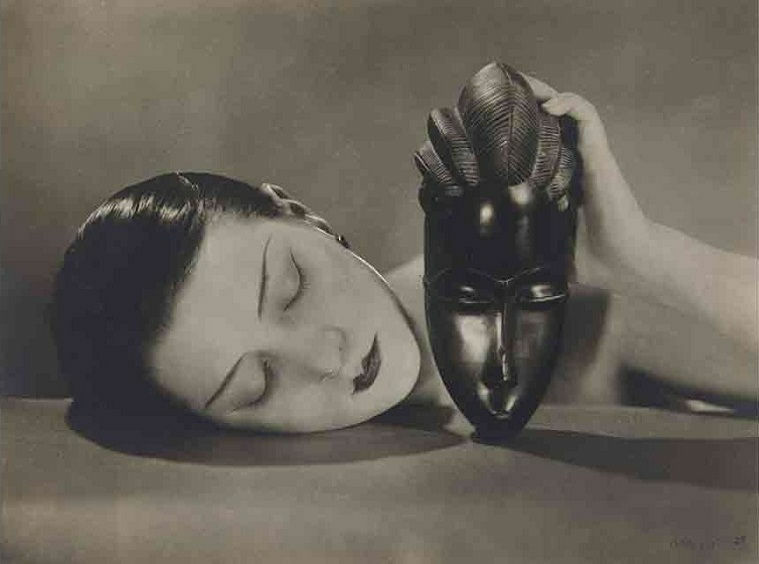 Published in a 1926 issue of Vogue, the work appeared with a caption, "Mother of Pearl Face and Ebony Mask," and, as art critic Daisy Woodward noted, "It is a majestic study in tone and texture: the patches of light on the dark, lustrous mask are echoed by those punctuating Montparnasse's shiny black hair, while, in contrast, her soft, porcelain-hued face and shoulder boast delicate patches of shadow." Noire et Blanche was published alongside Man Ray's reverse negative of the same image, thus inverting the play of black and white. With their oval shape, serene expressions, and reflective smooth surfaces, the two faces mirror each another, evoking cultural and racial overtones, but harmonized in their aesthetic balance. As art critic Woody Hochswender observed, Man Ray's "work came out of an era when photographers painted with light. There is a stillness about his fashion photography [...] His women never look into the camera. They seem to be in no particular space or place. They look chipped out of marble." The avant-gardist Man Ray enthralled the fashion world in the early twentieth century. In addition to his work for Vogue, Vanity Fair featuring his rayographs while the designer Paul Poiret commissioned him to photograph his fashion line. His existing oeuvre also informed the fashion world. For instance, his famous painting Observatory Time The Lovers (1936) was also used as a backdrop for a Harper's Bazaar fashion editorial. Due in part to Man Ray's (and Steichen's) involvement in the industry, Fashion Photography, now in tune with the avant-garde sensibilities of haute couture, earned its status as fine art. Man Ray's surrealistic photography inspired the next generation of photographers, including Cecil Beaton and Horst P. Horst, as well as more contemporary figures including Guy Bourdin, Paolo Roversi, and Jean-Baptiste Mondino's. Indeed, Noire et Blanche was referenced explicitly by Mondino in his 1999 monochrome advertisement for Jean Paul Gaultier where the African mask is replaced by a bottle of Classique perfume. Artwork description & Analysis: In this signature work, the head of the famous model-turned-designer, Elsa Schiaparelli, is seen emerging from a hatbox. She is wearing a panama wearing hat (by Suzy) that is crucial to the composition; its horizontal and diagonal lines are both emphasized and framed by the conical shape of the box as its lid (which helps frame Schiaparelli's profile). The cropping is slightly askew, playfully emphasizing the unorthodox point of view, while the soft white background, with its fluffy bedding and billowing curtains, lends itself perfectly to Beaton's tongue-in-cheek tone. In the 1930s Beaton worked with George Hoyningen-Huene and Horst P. Horst. All three explored surrealistic techniques and effects, though each photographer developed their own style accordingly. Irving Penn dubbed Beaton's images of Hollywood stars and fashion models (including Elsa Schiaparelli) as "The Beaton Woman". It was a reference to the way Beaton approached Fashion Photography with a distinctive, often witty, sense of unpredictability. Here, Schiaparelli's facial expression evokes a touch of disconcerting anxiety and sadness, this despite the playful nature of the composition. Indeed, in 2009, the famous British fashion photographer Rankin chose this image as one of seven that had had a transformative effect on Fashion Photography. Rankin argued that Beaton "set the template for fashion photography. Packaging a world of decadent beauty and above all selling a dream" and that in this particular photograph Beaton had demonstrated "his typical wit and elegance" in the way what Schiaparelli's apparel became "secondary to the beauty of the image." Artwork description & Analysis: This color photograph depicts Diana Vreeland, the renowned fashion director of Harper Bazaar, modeling on a deck of the Pauson house, designed by Frank Lloyd Wright. Vreeland confidently surveys the Arizona landscape. Bright sunlight and velvet shadows, along with the building's dramatic vertical and horizontal planes, create an elemental and geometric setting that compliments the rugged sunlit expanses of the desert. On the left of the frame, the empty landscape, a mingling of gold and reddish-brown tones, stretches away to a singular rocky peak set against a dark-blue sky. Vreeland, a famous model prior to becoming Harper's director, is at home in this environment and cuts a figure befitting of the stylish red sheath skirt and black blouse she is wearing. The overall effect is one of an independent and modern woman embracing the natural world with a relaxed self-confidence. A fixture at Harper's Bazaar for a little over 20 years, Dahl-Wolfe was initially hired by editor Carmel Snow in 1936. Snow stated that: "From the moment I saw [Dahl-Wolfe's] first color photographs I knew that Bazaar was at last going to look the way I had instinctively wanted my magazine to look." Art critic Oscar Holland went further when he observed that Dahl-Wolfe's "genre-defining images [which] focused on assertive, aspirational women [...] in casual - and often sun-drenched - outdoor settings," influenced fashion and popular culture for a full two decades. Dahl-Wolfe's classical training at the San Francisco Institute School of Art informed her strong sense of composition and color, as she herself observed, "You have to study color like the scales of the piano." At the same time her enthusiasm for art history was reflected in her preference for posing models in the vicinity of famous art works and designs (as seen here in Lloyd Wright's desert house location). Dahl-Wolfe's influence was felt especially by Richard Avedon who said, "She was the bar we all measured ourselves against." 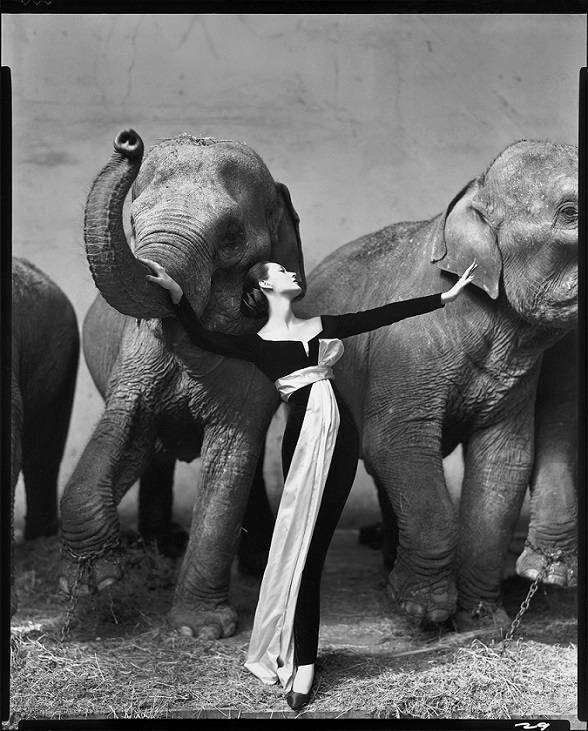 Indeed, Avedon acknowledged that her image Twins with Elephants (1947) directly inspired his own Dovima with the Elephants (1955). Artwork description & Analysis: Penn's iconic black and white Vogue cover depicts the American model Jean Patchett. It was commissioned by Vogue to replace the color cover images it had used since 1909. Such was its impact, the image helped define the 1950s and became a part of art photography's history. The image is one of simple contrasts and symmetry, the latter being broken with Patchett's playful sideways stare. To help get such sharp contrasts, Penn revived the earlier technology of the Platinum Palladium print. He also asked Patchett to use black lipstick which she was able to improvise by blending lipstick and mascara. By the 1950s, Penn's approach to fashion photography was one of "simplification and elimination." By removing all background interference, Penn was able to reduce his images to their bare bones; just the model and her apparel. Penn's stylistic awakening came following a trip to Paris where he took ownership of a theater curtain. Penn began to use the curtain as a backdrop through which he was able to recreate what he called "the light of Paris as I had imagined it, soft but defining." 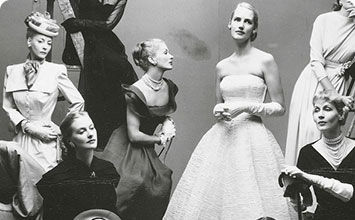 As Laird Borrelli-Persson wrote, "Simple, sophisticated, and potent as a dry martini" Penn's iconic Vogue cover "showcased the clean lines and tapered waists of Postwar Paris and New York, and transformed the aesthetic of the fashion industry." Patrick Demarchelier, Solve Sundsbo, and Nick Knight have all credited Penn's images as a defining influence on their own careers. By way of an interesting footnote, a signed (by Penn and Patchett), titled, and dated in ink copy of the photograph was auctioned at Christie's New York in 2008 where it sold for $266,500. Artwork description & Analysis: Arguably Avedon's most famous photograph, Dovima with Elephants, depicts the model wearing an Yves Saint-Laurent black evening dress designed for Dior. Her graceful, balletic stance - her arms reaching out towards the two elephants that flank her - is further emphasized by a flowing sash tied above her waist, and by the elephant's undulating trunk. The animals seem to be shifting rhythmically from side to side (further adding to the balletic effect perhaps) but, at the same time, we notice that the elephants' legs are chained which adds a poignant note on the theme of captivity. Indeed, the elephants' restriction is perhaps echoed in the figure of Dovima who, being tied about the waist with a giant bow, hints at a statement on the constraining standards of feminine beauty. Avedon was known for taking his fashion shoot out of the studio onto the streets, where his models were encouraged to engage expressively with their surroundings. Here, in the grounds of the Cirque d'hiver in Paris, the image evokes the archetypal encounter of beauty and the beast; of age and youth; of freedom and confinement. As art critic Cathy Horyn wrote, Avedon's "gift was not merely for the alive moment [...] it was for knowing which of the myriad of gestures produced the truest sense of the moment." Avedon's dynamic location shooting transformed European fashion photography and further cemented the rise of New York as the post-war center of the fashion world. This photograph also launched the career of the nineteen-year-old Yves Saint-Laurent in what was his first design for Dior. The image also made a star of Dovima who became one of the highest paid models of the 1950s. For his part, Avedon, who photographed 148 Vogue covers during his career, became revered as a sublime portraitist. As McDowell noted, "He treated his fashion shots as portraits, not just of a woman, but also as a dress and above all, an attitude." The freedom and spontaneity in his work made Fashion Photography appealing to young photographers like the British iconoclasts Terence Donovan and David Bailey. He was also an acknowledged influenced on Norman Parkinson, Guy Bourdin, Helmut Newton, Bruce Weber, Tim Walker and, in particular, Steven Meisel. Artwork description & Analysis: Bailey's photograph shows model Jean Shrimpton on a busy New York thoroughfare. She is wearing a trench coat and beret, holds a teddy bear in her left hand, and appears to be poised to cross the busy road. Standing on the sidewalk, and facing the spectator head on, she adopts a somewhat off-kilter stance: with her feet pointing in opposite directions, her right hand at an angle to her coat pocket, her body appears slightly contorted. It is as if she is responding to the word "TWIST" on the overhead signage (possibly invoking the sixties dance craze). At the same time, Shrimpton's rumpled coat, and the bedraggled teddy bear that hangs listlessly at her side, convey a forlorn, childlike air. Bailey and Shrimpton, who became involved romantically, met in 1960 on the set of a shoot for a Kellogg's Corn Flakes commercial. Already well-known for his photographs of "Swinging London," Bailey was assigned a New York City fashion shoot for British Vogue's new "Young Idea" feature. "The Young Idea" carried articles on youth culture and promoted more casual clothing styles such as the mid-priced British fashion lines of Jaeger and Susan Small. In America, however, Vogue's editor Lady Clare Rendlesham was unconvinced when Bailey arrived with the then unknown Shrimpton. The two travelled without makeup artists or hair stylists, and once in the city, Bailey elected to work in impoverished working-class neighbourhoods including Harlem and the Lower East Side. Photographing Shrimpton as she wandered the street in a trench coat (and carrying the teddy bear) evoked the so-called "kitchen sink realism" that was a defining feature of contemporary British culture that emerged through leftist literature, theatre, and film in the late 1950s. Indeed, the urban environment - Shrimpton is surrounded by signs, delivering a cacophony of different commands: "do not park," "cross at the sidewalk," "walk" - overlaps the glamorous world of Fashion Photography with the gritty realism of Street Photography. Despite Lady Rendlesham's reservations, Bailey's feature met with great acclaim on publication. Diana Vreeland predicted (correctly) a "Youthquake" for the fashion industry and the feature launched the careers of Bailey and Shrimpton who became Superstar and Supermodel respectively. The pair's New York series has had a long-lasting historical impact and in 2012 Bailey and Shrimpton's weeklong photo shoot was documented in the dedicated BBC film We'll Take Manhattan. Artwork description & Analysis: This rather tantalizing image depicts the elegant androgynous model, Vikebe, dressed in an Yves Saint-Lauren tuxedo with stiff white cravat. She is pictured on a deserted and narrow Paris backstreet, at night, and lit only by a row of streetlamps. One hand pokes out of Vikebe's pocket, the other holds a cigarette, while she looks down towards the ground. She seems to be in deep thought while her demeanour conveys an air of assured nonchalance. When Vogue Paris gave Newton (known as the "king of Kink" because of his penchant for fetishism) the assignment to photograph the season's fashions, he chose his own neighbourhood, the rue Aubriot in Marais, as his location; preferring its rough and archaic look to the grand or opulent settings offered in other parts of the capital. Shot at night, without any illumination except for the streetlamps, Newton's image pays homage to Brassai, whose photographs captured the nocturnal life of Paris in the early 1930s. This image in particularly alludes to Brassai's Belle de Nuit (1933), an image of a prostitute smoking on a dimly lit street corner. Before taking the image, Newton had asked Vikebe to imagine she was a 19th century dandy. The dandy was described by the French poet Baudelaire as someone "cultivating the idea of beauty in their own persons, of satisfying their passions, of feeling and thinking [...] Dandyism is not even an excessive delight in clothes and material elegance. For the perfect dandy, these things are no more than the symbol of the aristocratic superiority of mind." As a result, the woman radiates insouciant confidence, while challenging societal convention. As Newton said, "What I find interesting is working in a society with certain taboos and fashion photography is about that kind of society. To have taboos, then to get around them, that is interesting." Inspired by the artist Niki de Saint Phalle's "black tie trouser suit," Yves Saint-Lauren's tuxedo debuted in his 1966 Pop Art collection. However the response, in an era that still favored the little black dress, was underwhelming. The tuxedo was considered "outdated and lumpy." Newton's photograph had succeeded in changing attitudes, when, a decade on, the tuxedo became an iconic favorite, worn by female celebrities and models including Bianca Jagger, Jerry Hall, Catherine Deneuve, Liza Minelli, LouLou de la Falaise, and Lauren Bacall. Artwork description & Analysis: Turbeville's image presents five fashion models wearing a variety of casual fashions within an abandoned bathhouse. Each woman occupies their own space within the frame. A sense of mystery pervades, as the spectator is left to wonder what the relationship between the women might be, the clothes becoming almost secondary to the photograph's intrigue. Influenced by the film directors Jean Cocteau and Rainer Werner Fassbinder, Turbeville was known for offbeat and theatrical photographic compositions such as this. As she said, "I find personalities, look for interesting faces and do pictures in locations suggestive of the rest of the work. I combine clothes, people and place to make a story [...] I like strange places." Turbeville's work duly paved the way for countless fashion catalogues and features, evoking mysterious narratives that appealed especially to a younger, more urbane, fashionista. Turbeville came to photography in fact after a long career as a fashion magazine editor. She began as an assistant to the American clothes designer Claire McCardell before rising to the rank of editor at Harper's Bazaar. Realizing that she could not find a photographer to execute her personal vision, she turned to photography herself, enrolling in a seminar with Richard Avedon who, impressed by her work, became her mentor. She developed a unique style that, in the words of British Vogue editor Laird Borrelli-Persson, "grappled with the interior life of women and their changing place at a time when longstanding gender roles were as distorted as the reflections from a disco ball." Moving into the 1980s, Turbeville's photographs played a leading role in presenting the designs of Rei Kawakubo and Comme des Garcons with whom her strange and uneven compositions found a shared affinity. Later, Turbeville's images have courted acclaim outside the fashion world. As art critic Vince Aletti noted of her 2016 exhibit at Deborah Bell Photographs in New York, "Turbeville was not interested in the pristine print; she liked rough textures, uneven borders, grain, flare, blur, accidents. As a result, every picture has a spark of life, a lovely quirk [...] But even the single, more straightforward images in the show have a visionary quality, as if these women, these places, were hallucinated, not documented." Artwork description & Analysis: This signature Meisel image shows two supermodels of the 1990s - Linda Evangelista on the left, and Kristen McMenamy on the right - as they saunter down the luxurious paths of the Chateau de Champs in Champs-sur-Marne, France. Walking arm and arm, they are bedecked in hats of bows and veils, and frilly, elaborate, dresses that combine to convey a laissez-faire energy. As Alberto Oliva, Norberto Angeletti, and Anna Wintour all noted, Meisel's photography effectively liberated "haute couture from the heavy self-consciousness of traditional fashion photography" and he had managed to cultivate a style "that has come to define the seemingly effortless elegance and beauty that ruled the final decade of the twentieth-century." Meisel was working as an illustrator for the fashion designer Halston when he became fascinated by Fashion Photography. Drawing upon a variety of influences from the painting of Alex Katz to the photography of Nan Golden, to the films of Federico Fellini and Michelangelo Antonioni, he has said that his inspiration comes "from all over the place [...] it can be from the nineteenth century as long as it's new to me [or it] can come from going to the grocery store or looking at an artist from a million years ago." Meisel's bohemian aesthetic has also made him a leading portraitist of celebrities, and he is well known in popular culture for his long association with Madonna that began with her 1984 album cover Like a Virgin. He has photographed every cover of Italian Vogue since 1988 and since 2004 has been the photographer for every Prada campaign. Part of his success is due to his commitment to innovation, as he said, "My style changes constantly. Fashion is about change. In order to stay current and excited, I try new and different approaches." Artwork description & Analysis: This sultry and wraithlike image is of Tanel Bedrossiantz, model and muse to designer Jean Paul Gaultier. Modelling for the French designer's famous "Barbes" collection, it shows Bedrossiantz, his fixed gaze staring down the camera/spectator, wearing a low cut, tight fitting Gaultier dress. The model's air of defiance is confirmed in the detail of the cigarette, which he holds aloft in his left hand. The velvety bluey-green texture of the fabric and its corrugated bodice and cone-shaped bra create an sharply feminine impression which is contradicted by Bedrossiantz's masculine shoulders and arms. Finishing the effect, with only his head and torso illuminated, the model emerges into view from a black netherworld. As Roversi put it, "Photography for me is not representation, but the revelation of another dimension. By using the camera, I touch lightly on another life, opening the door to a different world." Roversi began his career as a photojournalist in the 1970s but turned to Fashion Photography on discovering the work of Richard Avedon, Irving Penn, and Helmut Newton. In the 1980s he developed his trademark technique of using an 8' x 10' Polaroid camera, later using the same format for digital prints. Whereas, generally speaking, Fashion Photography had "taken to the streets,' Roversi preferred to work in the studio where he sought the recreate the shadowing techniques of the classical masters. As he said, "I work like all painters do: with the light that comes from the window. I prefer subtracting to adding: I do not want anything around my subjects in order to magnify the person. For me photography is a very intimate act and, in my studio, this happens at my own pace." Roversi's fashion images first appeared in Marie Claire and soon thereafter in the Italian edition of Vogue and Harper's Bazaar. He has created advertising campaigns for Comme des Garcons and other avant-garde Japanese designers who took the fashion world by storm in the 1990s. Artwork description & Analysis: This image, published in Vogue in December 2003, features the model Natalia Vodianova as Alice (in Wonderland). The model, wearing a Viktor & Rolf silk dress, and with her hands placed defiantly on her hips, looks askance at Tweedledum and Tweedledee, standing just a few feet away to her right. The pair is "played" by the noted fashion designers Rolf Snoeren and Viktor Horsting, both dressed in suits of their own design. The three characters stand in the sunlit depths of a thick forest "where things have no names" and where Alice meets the two brothers (who, in Lewis Carroll's novel, recite "The Walrus and the Carpenter" and then, speaking a kind of philosophical nonsense, tell Alice that she is not real, but rather, an imaginary character). This work was part of Leibovitz's Alice in Wonderland Fashion Editorial, imaginatively interpreting Carroll's surreal literary masterpiece. Leibovitz, the acknowledged doyen of celebrity portraiture, is acclaimed for the theatrical sweep of her compositions. Indeed, as a recognized aspect of her style, the Alice in Wonderland feature works as a narrative composed of potential film stills. Art critic Roberta Smith noted that the images "jump[ed] off the wall with characteristic Leibovitzian flair - a heady mix of intimacy and posturing, elaborated, like paintings of saints, by recognizable attributes." A second art critic, Elizabeth Day, also picked up on Leibovitz's "trademark flourishes" before drawing her readers' attention to the typical "group shot of recognizable faces, each one striking an individual pose" with the composition as a whole "brought to life through a bold use of light in order to create the highly stylized, almost cinematic quality." Artwork description & Analysis: This short film (a little over two minutes in duration) shows various models wearing clothes by Givency, Molly Goddard, Hood by Air, and Naszir Mazhar. The model's gyrate and pose in dynamic split-screen images to the accompaniment of a Travis Scott soundtrack. Styled by Charlotte Stockdale, Phoebe Arnold, and Raquel Couciero, the models evoke different attitudes as they move in settings that employ color and light that, in the words of Knight, convey "both strength and delicacy, intimacy and discordance." In keeping with his usual practice, Knight's models are diverse, drawn from various racial and ethnic backgrounds. While Knight recruited some of his models through fashion agencies, he discovered others, new to modelling, through Instagram. As he said, "I think you convince people by showing them there is a better way [...] by showing the beauty and strength of these women of colour, it's the best way to convince people." This film was paired with another short film, 90210, both made for the 2016 British Fashion Awards, and for which Knight received the Isabella Blow Award for Fashion Creator. Having made his name photographing the Skinhead subculture and London's leading music and fashion personalities for i-D magazine, Knight founded SHOWstudio in 2000 to promote fashion film. His rationale went as follows: "clothes are made to be seen in movement. We've accepted that the way to represent clothes is by static image. I went over that again and again in my mind, and I thought 'Well, this can't be true to the designer's vision', because the designer always imagines them to be in movement. So there was a desire to really get closer to the designer's original vision and that's something that's given rise to fashion film, and it's very much a feeling that it's a better way of showing fashion." Knight's platform became the leading showcase for promoting fashion film and other platforms soon followed. The fashion magazine Dazed & Confused launched its Dazed Digital branch, and Vogue founded Vogue.tv., in 2007, while Prada launched its "Trembled Blossoms,", a short film, using animation and motion-capture technology, to showcase its spring/summer 2008 look.